1.1 These Terms and Conditions of Use set out important information regarding your rights, obligations and the restrictions that may apply when you use our website at the URL http://www.simonscat.com (the “Website”) which includes the services contained in the Website (which may include without limitation audio visual content, text, photographs, forums, chat rooms, advertising, competitions and other services) (together “Services”). 1.2 These Terms and Conditions of Use govern the relationship between you and Simon’s Cat Limited when you access and use our Services and Website. Any reference to “you” or “your”, means you as user of the Website and Services, any reference to “we”, “us”, “our” or “Simon’s Cat” is to Simon’s Cat Limited. For our contact details please see the end of these Terms and Conditions of Use. To create an account on the Website, you must be at least 13 years old. If you are over 13 but under 18 years old and wish to create an account, please seek the permission of your parent or legal guardian before doing so. We will disable the account of anyone found to be under the age of 13, and delete any details they may have provided to us. You may need to meet other age restrictions to use some of our partners’ websites accessible from the Website. 3.1 In accessing the Website and the material or content made available by us via the Website, you agree that you will do so only for your own personal, non-commercial use. To this end, you may access and review all pages of the Website, and print individual pages of the Website (but you may NOT photocopy them or print multiple copies other than for your own personal, non-commercial use). No licence is granted to use any intellectual property or other right in or to the Website or the Services in any manner whatsoever. Any copying, reproduction, lending or hiring, public performance, broadcasting or any other form of distribution of the content on the Website other than in accordance with these Terms and Conditions of Use is prohibited and will constitute a copyright infringement. This includes downloading or printing material, or extracts from it, in a systematic or regular manner or otherwise so as to create a database in electronic or paper form comprising all or part of the material appearing on this Website. The design, arrangement and look and feel of this Website is also the copyright of Simon’s Cat and may not be copied or otherwise reproduced. 3.3 You agree to comply with these Terms and Conditions of Use and our Code of Conduct when using our Services and Website and all applicable laws and regulations, together with any specific rules which may be posted on the Website in relation to any material and content that you access via the Services. 4.4 You agree to compensate us in respect of any damages or losses suffered by us as a result of any claim or legal action brought against us by any third party in respect of any matter arising from your use of the Services in breach of these Terms and Conditions of Use and/or our Code of Conduct or from your violation of any applicable law or regulation. 4.7 We may also ban or suspend you (at our discretion) as a user of the Website and the Services if you do not comply with these Terms and Conditions of Use and/or our Code of Conduct. 4.8 You may not create a link to the Website from another website or document without Simon’s Cat Limited’s prior written consent. 5.1 All intellectual property rights in the Website (including but not limited to the design, arrangement, graphics and look and feel of the Website) and all material or content made available by us and/or our partners via the Services (excluding any User Content (in respect of which see paragraph 11 below)) shall remain at all times the property of Simon’s Cat or Simon’s Cat’s licensors. 5.2 The names, images and logos identifying us, companies in the Endemol Shine group, our partners or third parties and our/their products and services contained in the Services are proprietary marks and may not be reproduced or otherwise used without express permission. 5.3 Nothing contained in these Terms and Conditions of Use shall be construed as conferring by implication any licence or right to use any trade mark, patent, design right or copyright of Simon’s Cat or of any third party. Certain of our Services use security technology to protect the material and content made available on our Services. You may not attempt to, or assist, any other person to remove or otherwise alter or interfere with any security technology used in connection with the Services, nor may you permit or assist in any way any third party to use the material or content made available by us via the Services in an unlawful manner or in a manner which could infringe the rights of, or restrict or inhibit the use and enjoyment of the Services by, any third party. 7.1 Registration is not required to browse the Website. However, you may be required to register your details for certain Services (for example, to access the forum (if available), register for the newsletter or to participate in special promotions) and open a user account that you can then use to access and log on to use those Services. If you register your details for any such Services, you may change or update your password or other details (except for your user name) at any time via your account. You promise that any information and details provided will be true, accurate and up to date in all respects and at all times. 7.2 You understand and accept that it is your sole responsibility to maintain the confidentiality of your password and that you are responsible for all activity that occurs under your user name and password. We will not be liable where your password is used by someone else. You should notify us immediately of any unauthorised use of your password and any breach of security as soon as you become aware of it. We advise you not to reveal any personal information about yourself or anyone else (for example, your telephone number, home address, e-mail address or any other details that would allow you to be personally identified) on the Website. You are entirely responsible for maintaining the confidentiality of your details when using the Services. 9.1 This Website may contain links to other third party websites and services through advertising or otherwise. These links are provided for your ease of reference, convenience and enjoyment only and they do not signify that we endorse such third party websites. We have no control over those third party websites or services and are not responsible for their availability or contents. 10.1 All Services on the Website are provided on an ‘as is’ and ‘as available’ basis. We do not guarantee which Services will be on the Website. We cannot promise that our Services will be free from errors or omissions nor that they will be available uninterrupted and in a fully operating condition. The Services may be suspended temporarily and without notice in the case of system failure, maintenance or repair or for reasons beyond our reasonable control, or otherwise at our sole discretion. We will not be liable to you or to any other person in the event that all or any part of the Services or Website are discontinued, modified or changed in any way or in the event that any of the Services or the Website contain inaccuracies or errors. 10.2 The views expressed in any content or material which is uploaded and/or contributed by you or other users of the Services on the Website (including without limitation the User Content) do not reflect Simon’s Cat’s views. 10.3 We do not represent or warrant that the information and material accessible via the Website is accurate, complete or current or that such information and material is suitable for any particular purpose. Your use of such information and material is entirely at your own risk. 10.4 The Services and the content and features of the Website are for your general information and use only. We reserve the right to change the Website or delete or add or modify content and/or features and/or any of the Services in any way, at any time, and/or for any reason as we may elect from time to time. 11.1.1 You promise that you are the original owner of any User Content you contribute or that you have the necessary licences, rights, consents, and permissions to authorise us to use your User Content on the Website and in accordance with 11.1.2 below. In particular, you promise that you are the copyright owner of the User Content (or are validly authorised by the copyright owner to make the relevant use of the material forming the User Content) and have obtained the express permission of all of the people featured or referred to in the User Content (and if they are under 18 the express permission of their parents or guardians as well) to include them in the User Content and to allow the use by us of the User Content on the Services and in accordance with 11.1.2 below. You agree to give us evidence of all such licences, rights, consents, and permissions immediately on request by us. You acknowledge that the contents of any User Content material which you choose to place on the Website will be considered non-confidential. 11.1.2 By submitting User Content, you grant us a worldwide, irrevocable, perpetual, non-exclusive, royalty-free and transferable licence (with the right to sub-license) to use, edit, reproduce, record, modify, translate, distribute, play, perform, and otherwise make available (including to other users), prepare derivative works of and to use and include your User Content on the Services and/or as part of any other work, programme or film (including without limitation as part of the Website and/or Simon’s Cat’s Profiles and/or the Simon’s Cat Works) and/or in connection with the publicity and promotion of our business, content and services (including the Services and any other work, programme or film such as the Simon’s Cat Works) in any and all media and by any method whether now known or later developed throughout the world for the full term of copyright and any other rights and all renewals revivals and extensions thereof. For the avoidance of doubt, no revenue generated by our use of the royalty-free licence granted hereunder shall be payable to you. You also agree to waive your moral rights in your User Content. You understand and agree that once you submit User Content we shall be unable to modify or remove it from the Services or such other work, programme or film (including the Simon’s Cat Works), even if your access to the Website and/or the Services has been suspended, restricted or terminated. 11.2 You are responsible for the contents of any User Content you make and the consequences arising from its use on our Services. (Please note that we cannot accept any User Content containing any music, save where expressly permitted by us.) You agree that you will not upload to the Website any material or content which is in any way defamatory, obscene, unlawful, harmful, offensive or inappropriate or infringes the rights of a third party or may have the effect of being insulting, harassing, threatening, abusive or hateful or which otherwise degrades or may be seen to intimidate an individual or group of individuals on the basis of religion, gender, sexual orientation, race, ethnicity, age or disability. You agree not to infringe any laws in order to produce or submit the User Content. You agree not to transfer files which contain viruses or other harmful programs. Further, you must not endanger yourself or others, take any unnecessary risks in order to produce or make available the User Content. Please refer to the Code of Conduct for further information about use of the Services. 11.5 You understand and agree that Simon’s Cat is not obliged to include any User Content submitted by you in whole or in part in any Simon’s Cat Works. 11.6 You further understand and agree that Simon’s Cat has no obligation to protect or enforce your rights (if any) in the User Content. 11.8 You warrant that any User Content you submit hereunder complies with the terms of this paragraph 11, and you will be liable to us and you agree to indemnify us and our subsidiaries, affiliates, officers, employees, advertisers, partners, agents and representatives, and to hold them harmless from any and all claims, demands, liabilities, damages, costs and expenses (including legal fees) that may arise from: (i) your contribution(s) or provision of User Content or (ii) your breach of these terms and conditions. If any provision of these Terms and Conditions of Use is found by any court or administrative body of competent jurisdiction to be invalid or unenforceable such invalidity shall not affect the other provisions of these Terms and Conditions of Use which shall remain in full force and effect. These terms shall be governed by and interpreted in accordance with the laws of England and Wales and the English Courts shall have exclusive jurisdiction over any disputes. You may be asked to agree to further terms and conditions when using specific Services (for example entering competitions promoted by us, or by our partners on the Website, submitting materials, or when subscribing to the newsletter). If there is any inconsistency between these Terms and Conditions of Use and any such terms and conditions, the latter terms and conditions shall prevail. These Terms and Conditions of Use were last updated on 3 March 2017. Please note that we may update and amend these Terms and Conditions of Use from time to time and any changes will be posted on the Website. However, it is your responsibility to ensure you review these Terms and Conditions of Use regularly to familiarise yourself with any changes. We will not file or store a copy of these terms for each transaction by you via the Website. We therefore recommend that you print and store or save a copy of these Terms and Conditions of Use for future reference. You can e-mail us with any questions, queries or complaints at contact@simonscat.com or you can write to us at Simon’s Cat Limited, Shepherds Building Central, Charecroft Way, Shepherds Bush, London W14 0EE. 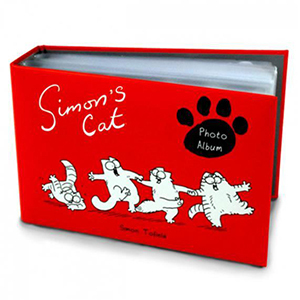 All text, graphics and other content on this Website (save for any User Content which is used under licence) is the copyright of Simon’s Cat Limited or its licensors. Simon’s Cat ® is a registered trade mark of Simon’s Cat Limited.